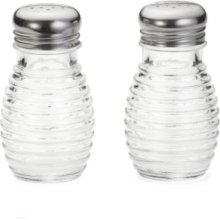 Create a stylish and elegant look with the Tablecraft BH2 2 oz beehive salt and pepper shakers. The glass shakers come with 18-8 stainless steel, corrosion resistant tops. Holds 2 oz.